Punjab’s economy is mainly agrarian. The economy of Punjab has shown a growing trend post-independence.The state is working towards high industrial output as a measure of progressive changes taken by the Government. Punjab’s economy is influenced by Agriculture, Industries and Power on a large scale. Punjab is widely acknowledged as the “Granary of India”. Since the land is fertile and free from physical handicaps, agriculture is very profitable in the state. Agriculture is carried out using tube and canal irrigation. Punjab receives scanty rainfall, but rivers in the region provide respite. Cultivation is either Rabi (Spring harvest) or Kharif (Autumn harvest) based. Punjab is India’s largest producer of barley. Major crops include wheat, rice, sugarcane and cotton. Fodder crops like jowar and bajra are cultivated to a large extent. Oilseed production has a prominent role to play in the state's economy. Punjab is not self sufficient in its availability of minerals. Industries are mainly agro based. Industrial growth in recent years has been a major contributor to the state’s economy. Excellent connectivity by road, rail and air has paved way for industrial progression. Prime industries are Cotton textile, Sugar, Dairy, Sports goods, Hosiery and Engineering goods. As Punjab is a major producer of cotton in the country, Cotton textile industry has reached massivegrowth. Sugar industries in the state are mainly run by the co-operative sectors in the state. 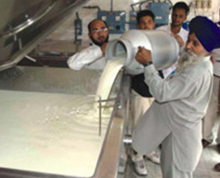 Dairy and its products are produced on a large scale. Most of the dairy consumption is by the household sector. Fodder industry has gained importance due to large presence of livestock. Oilseeds for fodder have great demand. Jalandhar is renowned for the production and export of Sports goods.Engineered goods like Bicycles, Tractors are manufactured on a large scale. Hosiery in particular, is contributing towards a great input of foreign exchange. Punjab is not only self-sufficient but because of its surplus power production, provides power to its neighbouring states also. The state has both Thermal and Hydro-Electric power projects as its sources. Punjab is home to major rivers like Sutlej, which provides the back up. Major power projects are Bhakra-Nangal power project, Guru Nanak Power project and Ropar Power project. Other sectors like Banking, IT Services, Real Estate, Housing are also doing extremely well which makes the future bright for Punjab's economy.